A surrealistic and dreamlike new take on the classic American road movie, Welcome to Nowhere (Bullet Hole Road) follows the overlapping encounters of five strangers as they struggle to exist in the American desert. Constantly shifting perspective, the fractured narrative revolves around a poet, a hitchhiker and three motel rooms. In a series of warped, image-driven episodes, archetypes of American road stories are deconstructed in action, dialogue, intent, and ultimately meaning. Reduced to a series of actions and minimal dialogue, these representations of the American promise of freedom on the open road disintegrate into paradoxical fantasies of improbable escapism, perverse sexuality and futile violence. Part animation and part live-action, the film is a uniquely visual cinematic experience. The Queens Museum of Art is featuring Welcome to Nowhere (Bullet Hole Road) as part of its 6th Queens International Biennial. The screening is planned for Saturday, December 7th, 2013 at 6pm. Visit the Queens Museum website for more information and to plan your visit to the newly renovated art center in Flushing, NY. Don Simpson, the Senior Editor of Smells Like Screen Spirit gives Welcome to Nowhere (Bullet Hole Road) a rating of 8 out of 10. “By boldly mashing live action with motion graphics animation, Cusick establishes a universe that falls somewhere between the hyper-real and the unreal.” You can read the review at Smells Like Screen Spirit. Welcome to Nowhere continues streaming free on NoBudge.com through Oct 17. Steve Rickinson, Editor-In-Chief of the NYC film website Indiewood/Hollywoodn’t reviews Welcome to Nowhere (Bullet Hole Road) and describes it as “an intense collection of nihilistic fantasies.” 3 out of 5 big apples! Read the capsule review on Indiewood/Hollywoodn’t here. Matt Oakes, the editor of Smart Film and Silver Screen Riot film blogs, interviews writer/director William Cusick about Welcome to Nowhere (Bullet Hole Road). Oakes describes the film as “hallucinatory emotional turmoil in shifting visual splashes” and goes to discuss the aesthetics, emotionality and meaning of the film with Cusick. Read the interview here on Smart Film Blog. Read Rob Hubbard’s review on 366 Weird Movies. Welcome to Nowhere (Bullet Hole Road) continues streaming through October 17th at Kentucker Audley’s newly revamped independent film platform NoBudge.com. Watch it right now. Welcome to Nowhere (Bullet Hole Road) is now streaming for free online at NoBudge.com through October 17th. This free online stream is available for 1-month only. 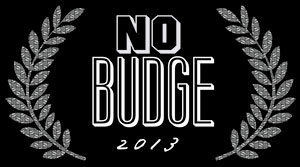 No Budge covers the world of true indie films. It was started in February 2011 by filmmaker Kentucker Audley to premiere & compile true indie films. Free + no ads + no piracy. It has been called “innovative” (Filmmaker Magazine) and “indispensable” (GreenCine). The film and director William Cusick are featured in the premiere issue of Chance Magazine, the most innovative art-magazine on American theater design ever published. After a hugely successful Kickstarter campaign, the magazine is off to a running start as it aims to take the design and publishing worlds by storm. Get your inaugural copy on the newsstands or online now and read about the making of the film. Welcome to Nowhere is an official selection of the 2013 Cinetarium Film Festival in Wasau, WI. The movie screening is on Saturday, May 4th at 10:20PM at The Wasau Plaza Hotel, the festival’s principal venue. If you’re in the area, do check it out. Tickets are on-sale now via Paypal. 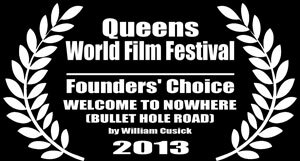 Welcome to Nowhere (Bullet Hole Road) was awarded the Founders’ Choice honor at the Queens World Film Festival. The film is screening on Sunday, March 10th at 5:15pm as part of the winners block at The Secret Theatre in Long Island City. Follow this link more details here. Director William Cusick did an interview with IndieNYC.com about the film. Steve Rickinson, IndieNYC’s Editor-In-Chief, asked great questions that ought to help illuminate some concepts behind the film. Check it out over on their website – interview link. Welcome to Nowhere is an official selection of the 2013 Queens World Film Festival here in NYC. The movie screening is on Thursday, March 7th at 10:15PM at The Jackson Heights Cinema, one of the many exciting venues for this year’s festival. 40-31 82nd Street, Jackson Heights (Queens), NY. Welcome to Nowhere (Bullet Hole Road) will be screened in Las Vegas as part of PollyGrind’s March Madness weekend. Dates and screening time to be announced shortly. Thanks for checking back! We’re very excited to announce the Dreamland International Film Festival has awarded Welcome to Nowhere (Bullet Hole Road)’s Cara Francis with the honor of Best Supporting Actress. Welcome to Nowhere (Bullet Hole Road) is an official selection of the Dreamland Film Festival in New Haven, CT. The film screening is on Saturday, Oct 27 at 8:15PM at the UpCrown Gallery, New Haven’s newest art gallery and multi-media studio. Tickets on-sale at the door. 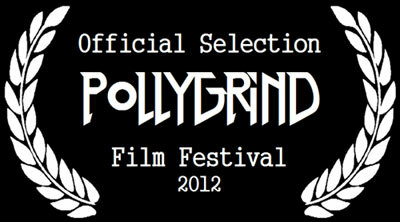 Welcome to Nowhere (Bullet Hole Road) is an official selection of the PollyGrind Film Festival in Las Vegas, Nevada. The film will be screened in early 2013 during one of the ongoing festival weekends. More info coming soon. Welcome to Nowhere (Bullet Hole Road) is an official selection of the NewFilmmakers New York screening series here in New York City. The film screening is on Tuesday, July 3rd at 8:15PM in the East Village at Anthology Film Archives, NYC’s home for independent cinema. Welcome to Nowhere (Bullet Hole Road) is an official selection of the Second Annual LES Film Festival here in New York City. The festival runs for two weeks from March 6th – March 18th on the Lower East Side and is a showcase of low-budget independent cinema. UPDATE – screening at GRAND OPENING at 139 Norfolk Street on Saturday, March 10 at 6pm. Dustin Freeley, of the film analysis and commentary website Movies About Gladiators, took a look at the film and wrote up a brilliantly sharp critique, looking at the film against the history of American Road Movies. Head on over to their site and read the critique before or after you see the film. The article is called A Savage Journey to the Heart of the American Road Movie.